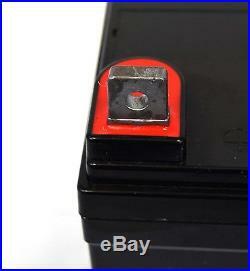 12V 35AH Replacement Pride Mobility Jet 3 Ultra Wheelchair Battery. 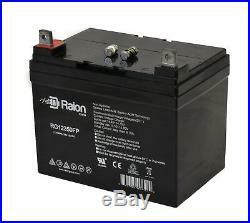 Some wheelchair models use two 12V 35Ah Sealed Lead Acid Batteries. These batteries are connected in series to make 24V system. Range for wheelchairs is about 32 miles based on a 180 pound driver on a flat surface. Range may vary depending upon the weight of the driver, state of charge of the batteries and the surface on which it is driven. 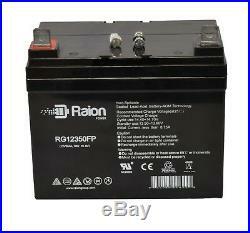 The brand of this battery is Raion Power. Valve Regulated Spill Proof Technology. 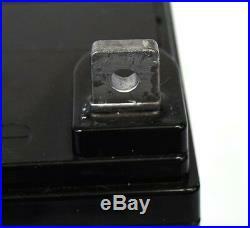 Enables the battery to be installed in various positions. Lead Calcium grid has lower float current. This leads to less water electrolyte loss, and in the end, it improves the lifespan of the battery. The acid is held inside the glass mat. In the end, this makes the battery perform to standard. When multiple batteries are ordered, we ensure that each battery is voltage matched. This extends the battery life and your equipment life. This will also ensure the lead composition is from the same batch. What Comes With Your Order. 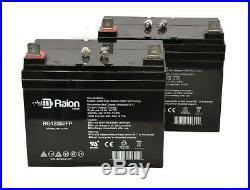 2 12V 35Ah Raion Power Replacement Batteries. 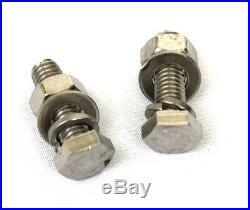 2 Sets of Nuts & Bolts - Each battery ordered comes with 2 sets of nuts & bolts. Raion Group strives for excellent customer service. We, as a team, want to make sure that you find the product(s) that you are looking for, and that your product(s) meet your needs. We will make sure that you find the battery you are looking for, and that your product meets your standards. 7.70 in x 5.16 in x 6.10 in. Absorbent Glass Mat (AGM) technology creates superior performance. Alve Regulated: Spill proof construction. We will send you the batteries that were manufactured in the same batch. Also, in our final inspection of the batteries, we take the extra step in voltage matching the batteries that you ordered. Voltage matching will not only ensure optimal performance, but it will extend the battery and equipment life. Red (Positive) & Black (Negative). Charge voltages are marked on the battery for cyclic and float applications for your convenience. Specifically designed for deep cycle applications. Data Sheets available upon request. UL (Underwriters Laboratories) and CE (Consumer Electronics) Safety Certified. (logos are officially printed on the products). Orders placed prior to 11 A. This means you will receive your product in 3 days or less! Our goal is to provide excellent service and top quality products at an affordable price to our customers. We strongly recommend you to post a feedback and share your shopping experience at the. 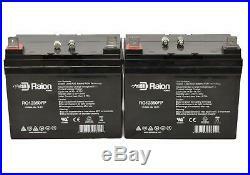 The item "Raion 2 Pack- 12V 35Ah Pride Mobility Jet 3 Ultra Wheelchair Replacement Battery" is in sale since Sunday, March 23, 2014. This item is in the category "Health & Beauty\Medical & Mobility\Mobility/Walking Equipment\Mobility Scooters". The seller is "raiongroup" and is located in Plano, Texas. This item can be shipped to United States.